Jakarta, 25 November 2018. On 22 November 2018, the Constitutional Court issued a verdict of the case No.13 / PUU-XVI / 2018 concerning the testing of Law No.24 of 2000 on International Agreement of the 1945 Constitution. This case was filled by the Advocacy Team for Economic Justice on February 14, 2018 to the Constitutional Court. There are at least 4 reasons as the background of why the International Treaty Law was sued to the Constitutional Court, namely: First , international agreements (specifically trade, investment and debt) have a broad impact on people’s lives; Second , the loss of democracy; Third , the power of the Government is too large (absolute power); and fourth , to restore people’s sovereignty. Several articles were tested on the International Treaty Law, namely Article 2, Article 9, Articles 10 and 11. The four articles were tested because they were thought to have caused legal uncertainty for the people as a result of losing control and involvement of the people in the process of negotiating international agreements. In fact, the seemingly confidential negotiation process with the closed participation and public access to information and the text draft of the agreement in the negotiations on free trade agreements and international investment has threatened democracy and the protection of human rights. Moreover, this free trade and international investment agreement was ratified without requiring the approval of the Republic of Indonesia Parliament so that the loss of function of the people’s control over the Governments’ power. The Constitutional Court has presented new legal norms in the international agreements. In reading the verdict, the Constitutional Court ruled that Article 10 of the International Treaty Law was contrary to the 1945 Constitution, specifically Article 11 paragraph (2) and Article 28 D paragraph (1). Although, the Constitutional Court only granted part of all the requests, but for the advocacy team of economic justice, article 10 is the heart of the lawsuit. This is because this verdict has become a breakthrough for the renewal of the national legal system, especially in relation to the International Agreement with the changing dynamics of the global community that needs to be adjusted. The core issue in this lawsuit is related to the distribution of international agreements that require the approval of the house of representative/DPR and which are not. These provisions are regulated in articles 10 and 11 of the UUPI. This is a gray area in the practice of policy making, which if not carefully decided will have a fatal consequences for the national interests. Article 10 of the UUPI regulates the category of International Agreements that require the approval of the DPR RI, which is related to the problem: (1) political issues, peace, defense and state security; (2) changes in territory or territory determination of the Republic of Indonesia; (3) sovereignty or sovereign rights of the state; (4) human rights and the environment; (5) the establishment of new legal rules; (6) loans and / or foreign grants. The advocacy team considers that the international treaty division in Article 10 and Article 11 is contrary to Article 11 paragraph (2) of the 1945 Constitution, because in practice there are international agreements that have a broad impact on the lives of the people but not through the DPR RI approval process so that checks and balances by the DPR RI unable to be done. An example is the trade agreement and investment protection agreement (Bilateral Investment Treaty / BIT) in the dynamics of global development today, it turns out to have a broad impact on the lives of the people but in the process of ratification does not require the approval of the DPR RI. Therefore, these two agreements can no longer only be called international agreements that regulate technical and procedural matters. In fact, there are also practices that are out of sync with the implementation of Article 10 and Article 11 of the UUPI, when the Government of Indonesia ratifies the Agreement of AIIB- Asian Infrastructure Investment Bank (debt) not with the approval of the DPR. This certainly causes the consequences of legal uncertainty for the people as stipulated in Article 28D paragraph (1). Therefore, the approval of the DPR RI which is a representation of the people’s voice is very important to international agreements that have a broad impact on the lives of the people, including those that have an impact on state finances and cause changes and / or forming legislation. Article 11 paragraph (2) of the 1945 Constitution of the Republic of Indonesia which states: “The President in making other international agreement which have a broad and fundamental consequences for the lives of the people related to the burden of state finances, and / or require changes or the formation of laws must be approved by the House of Representatives”. On that matter, the Constitutional Justice Board in its consideration stated that the DPR’s Approval was needed for an International Agreement which was deemed important only. Agreements that are considered important, in accordance with those stipulated in the Constitution. In general, in consideration of the judge, the criteria for the important agreement were mentioned: the Agreement with political dimension that has is relevant with state sovereignty such as an agreement influencing state borders, which affect federation relations with other states, which affect the burden of state finance that must be borne by the people, which affects the balance or division of the king’s power with parliament, which has a broad impact so that new laws are needed. And it can increase according to the needs or considerations of each country. Regarding in what way or in the circumstances of how an international treaty material causes broad and fundamental consequences related to the financial burden of the state and / or requires changes or the formation of laws, the panel of judges considers that it cannot limitatively determined but must be assessed casuistry based on consideration and developments in legal needs nationally and internationally. Previously Article 10 of the International Treaty Law limited only six categorizations of international agreements that had a broad impact on people’s lives. Of course, the enthusiasm in Article 10 of the International Treaty Law has made exhaustive criteria or qualifications limited to the six aspects in question, while Article 11 paragraph (2) of the 1945 Constitution makes an open criteria. Article 11 paragraph (2) of the Constitution states: “The President in making other international agreement which have a broad and fundamental consequences for the lives of the people related to the burden of state finances, and / or require changes or the formation of laws must be approved by the House of Representatives”. Therefore, the Constitutional Court through its verdict to expand the categorization of international agreements that has a broad impact on people’s lives that is not only contained in Article 10 of International agreement Act. So, the issue of trade, economy, investment, double taxation, and even foreign debt can be part of a broad-based international agreement that requires people’s approval, in this case through the DPR RI. One important point in the consideration of the Constitutional Court Judge that the involvement of the state in international treaties under the pretext of world order should not conflict with the principles of independence, peace and social justice. Before the Constitutional Court’s verdict, there were very many bilateral, regional and multilateral agreements that were far from social justice and adopted the spirit of people’s interests. In fact, when the agreement is ratified in national law, it will have an impact on all elements of society. Of course, after this Constitutional Court ruling, actions that harm the interests of the people and injure social justice over the implementation of the international agreement are not allowed to be returned. Whereas in the previous practice there was a potential where international agreements that were ratified without the approval of the DPR RI that could have a broad impact on the lives of the people, which could later harm social justice.For this reason, the advocacy team encouraged them to do the process of reviewing all international agreements, especially against trade, investment and foreign debt agreements to fulfill the elements of social justice and in harmony with the mandate of the Constitution. That for the International Agreement to be ratified, it must comply with this Constitutional Court’s verdict. Particularly related to free trade agreements and investments, there are some that have been discussed and will enter the ratification stage such as Indonesia-Australia CEPA, Indonesia-Europe FTA (IEFTA), and Indonesia-Singapore Bilateral Investment Treaty (BIT).Therefore, the agreements to be ratified must be examined as agreements that are “important” so that they require the approval of the DPR. Because the constitutional panel of judges has accepted the constitutional loss of the Petitioners who have never been involved in the decision-making process of international agreements, especially trade, investment and foreign debt, then in the case of international agreements that have a broad and fundamental impact on people’s lives, then The Government and Parliament of the DPR RI must open and involve the public at large in the process of public consultation to get the views on the impact that will result from the agreement on the state’s financial burden weighing on the public and on the formation of the new legislation. Specifically on the Trade Law No.7 of 2014 concerning Trade, the Advocacy Team considers that Article 84 paragraph (3) and (4) of the Trade Law have contradicted the verdict of the Constitutional Court No.13 / PUU-XVI / 2018.This is because, the time limit for The DPR RI to determine an international agreement whether it needs the approval of the DPR RI or not as stipulated in Article 84 paragraph (3) and (4) has not been in accordance with the Constitutional Courts’ verdict. 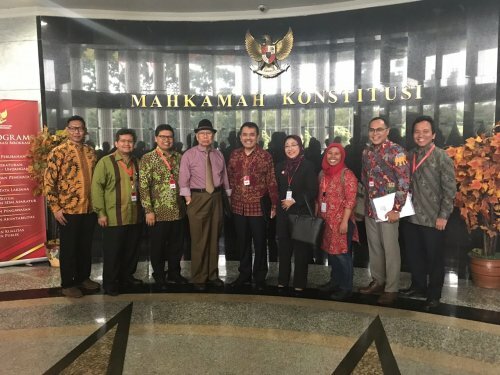 In its verdict, the Constitutional Court judges argued that to assess an international agreement that was important or not important, it must be carried out by the DPR RI. Therefore, related to the takeover of 6 trade agreements that were being discussed by the DPR some time ago by the Government and unilaterally stating that the agreements were deemed not to require the approval of the DPR RI, it is fitting to say that the actions of the Government were contrary to the mandate of Article 11 paragraph (2) of the 1945 Constitution which has been decided by the Constitutional Court in Case 13 / PUU-XVI / 2018. That the evaluation of an international agreement is important and has a broad impact must be carried out carefully and based on the meaning of the mandate Constitution. Specifically related to trade and investment agreements, in determining the agreement including agreements that are important and have a broad and fundamental impact on people’s lives in accordance with the Constitutional Courts’ Verdict, it is necessary to conduct a comprehensive impact assessment by the DPR before giving an approval for a trade investment agreement.Impact assessments can be made on their impact on the economy, social, environment and human rights. The results of this impact assessment must be the basis arguments for the DPR RI and the Government to determine whether that International Agreement is important or not. This Constitutional Court Verdict must be immediately responded by the DPR RI where the Act No.24 of 2000 concerning the International Agreement is no longer appropriate, and it is necessary to immediately make changes to the law.The Constitutional Court’s verdict must be a reference for the DPR RI and the Government in the process of change. And specifically, the formulation of a consultation process that must involve wider public participation must be carried out because international agreements have a broad impact on people’s lives, in economic, trade, debt, double taxation, investment and other issues. And legal consequences must be included if an international agreement is passed without involving the public in it. Indonesia for Global Justice (IGJ), IHCS, Indonesian Peasants Union (SPI), FIELD Indonesia, KIARA, Bina Desa, Indonesian Peasants Alliance, Women’s Solidarity for Human Rights (Solidaritas Perempuan), Palm Oil Farmers Union, and 5 Salt Farmers (Amin Abdulah, Mukmin, Fauziah, Baiq Farihun, Budiman).